Shingeki no Kyojin Final Episode: Mission…success? So in the very end, Eren couldn’t throw away his humanity. I guess he has a long way left to go. That’s mostly why this last episode basically begs for a second season. Given all the hype this show has, I’m actually surprised it hasn’t been scheduled yet. To qualify that, I’m not saying Eren has to toss away his humanity to “end the show”, I’m saying that a true resolution can’t come unless he either embraces the monster within or finds a way to use his compassion to change the world (this being the more likely and cheesy of endings). I’m still disappointed about the basement, but I guess we still don’t know a lot about this show, so what can we do? Still curious about whether there’s an organization behind it all and what their motives may be. Do I invest time into the manga or wait for a possible second season? Author marthaurionPosted on October 2, 2013 Categories Shingeki no KyojinTags anime, attack on titan4 Comments on Shingeki no Kyojin Final Episode: Mission…success? Well, that’s moderately interesting…the show is actually encouraging Eren to abandon his emotions and fight for the greater good. You don’t usually see stuff like that. Usually it’s something like “I’m gonna save everyone” and all that. Wonder if this idea lasts or if it eventually gets soften up to saving the world. We probably won’t find out soon. Next week should be the last episode and it definitely won’t have a full resolution. Heck…I’m expecting it to end on a cliffhanger based on how things are paced. Anyway, the preview makes it sound like Eren has lost control again and will attack allies…but they wouldn’t do that again, right? We still don’t know why she chose to betray everyone and who is in charge. She can’t be acting alone. Actually, I wouldn’t be surprised if the entire Gendarmerie is part of this plot. Will we even find out? It looks to me like this season will end with her death…I don’t even think they’ll have a chance to question her. Either way, next week is a fight. 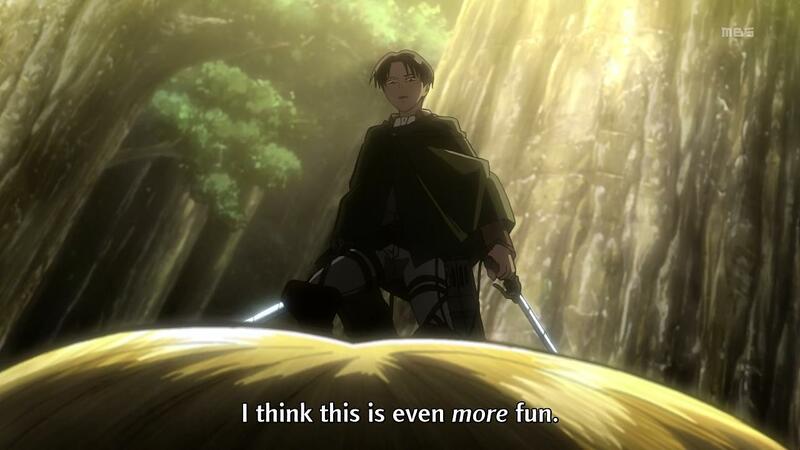 So Levi is as overpowered as they say he is. The question is whether he was able to do that all along, which would have saved his squad, or whether he was only able to do that because the Eoten was tired and less capable of fighting back, which slightly validates his squad’s deaths. Anyway, Eren’s in trouble once again now that the plan has failed…looks like Armin may come up with a plan to save him once again, judging by the preview. The series is nearing an end…how will it resolve? It’s looking more and more like a cliffhanger….I thought they might at least reach the basement, but I’m not even sure that’s gonna happen now. So that ended quickly…I knew that “faith” stuff was just a load of crap. Everyone just dies. To be fair, Eren failed pretty hard too because he doesn’t have energy for the long fight, but what are you gonna do? Anyway, the Eoten made a point to swallow Eren whole, so she clearly has no intention of killing him. It’s much more likely that whatever organization is running these human Eotens is trying to recruit Eren for their cause. Either that or they’re trying to study him because his Eoten transformation was uncharacteristic of normal ones somehow. Either way, we’ll have to see if she makes it out with Levi and Mikasa ready to face her. Interesting…so this really is someone like Eren. Then I guess it’s safe to say that unless Eren’s father is helping the other side, the transformation into an Eoten must be inherent in humans and Eren’s was just forcefully induced by his father. It also seems like whoever the culprit is, she has a lot better control over her transformation than Eren does. But now the question is: what is the motivation? What is causing these humans to take Eoten form and take down the walls of humanity? I guess it could be that they just want humanity to live as Eotens or something…but is that all there is to it? Or maybe I’m completely off base because I misinterpreted something. Anyway, next week the fight against human form, I guess. So they wanted to capture the Eoten and cut out whoever is inside. I guess they were talking about their new technique to “half-kill” Eren. Episode wasn’t all that interesting…Eren just had to trust in the judgment of others or whatever. It makes sense because he has always been a crazed berserker before, but it wasn’t exactly entertaining. Everyone’s just getting killed left and right. It looks like half the squad is dead by now. But they continue to follow orders. I guess that’s all they can do. Will Armin be able to figure out Elwin’s plan? Seems like that’s what all the recruits are waiting for. Is this all supposed to be some sort of test for Eren? It looks like he might use his power again to fight next week. Depends on what Levi does, I guess. Not sure why he wanted everyone to cover their ears…high frequency sound burst seems unlikely. Maybe hiding something he’s about to say? 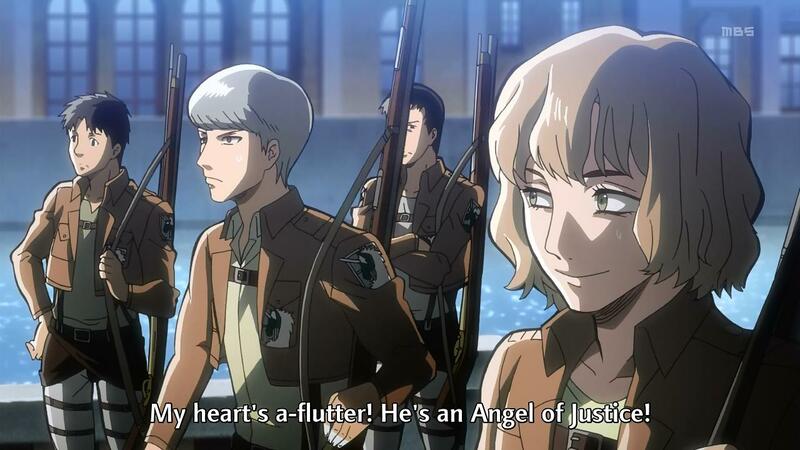 Shingeki no Kyojin Episode 17: Armin’s pretty smart, huh? 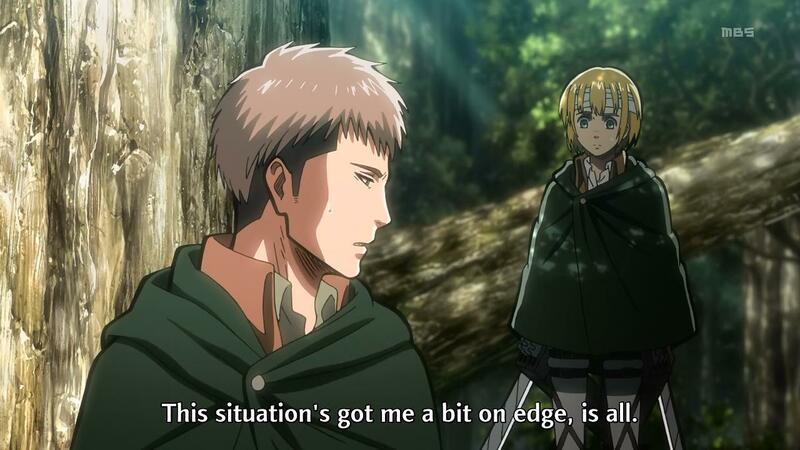 Wait…Armin thinks it’s another Eoten just like Eren? But…how could this have happened? More experiments from Eren’s father? I guess we don’t know the true nature of Eren’s condition yet…it’s possible it’s a natural thing that happens to some humans and Eren’s father was just able to manually induce it. 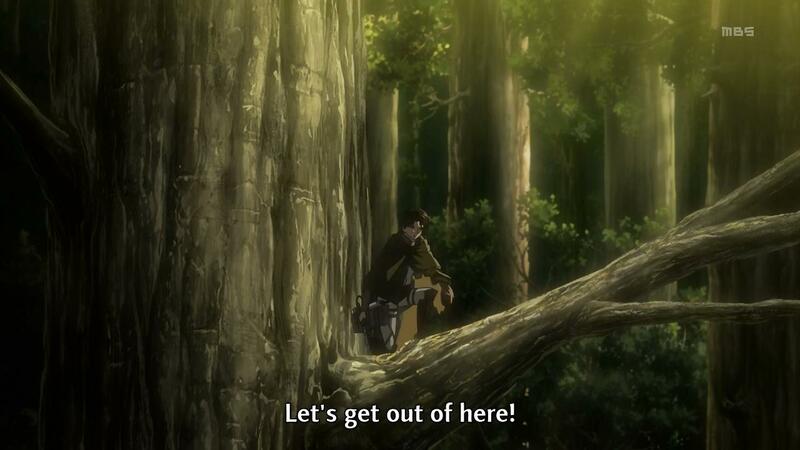 Either way, this intelligent Eoten is headed straight for Eren…how did she even figure out where he was? She couldn’t have heard Armin, right? Anyway, epic fight between Eotens might be coming up. Either that or Levi and Mikasa just kill her…either works for me. Also…Reiner is boss. Author marthaurionPosted on August 8, 2013 Categories Shingeki no KyojinTags anime, attack on titan2 Comments on Shingeki no Kyojin Episode 17: Armin’s pretty smart, huh? Well, Eren gets to be reunited with his friends. They’re all on the Legion together…even Potato Girl. 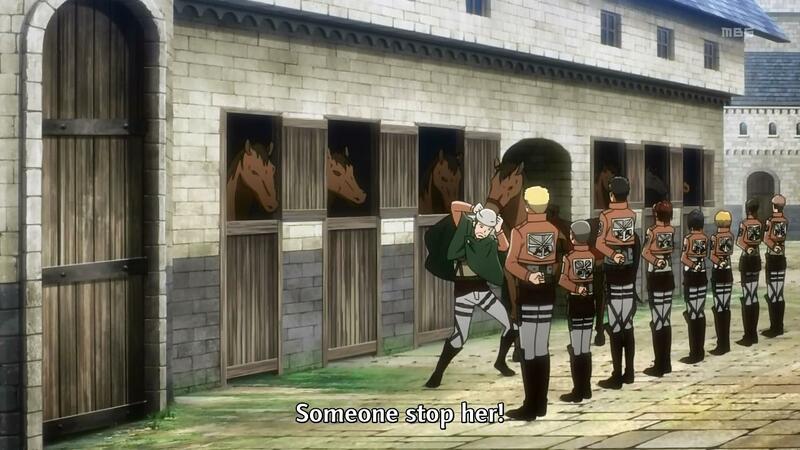 I guess this episode was supposed to be some grand moment where Jean realized he couldn’t just run and hide. Marco inspired him too much or something. Oh well…I always knew he’d join the Legion anyway. So now the first mission as the new members of the Legion will begin. How many will die? Now that the group has been reduced so much, have we finally reached a semi-stable number of characters? 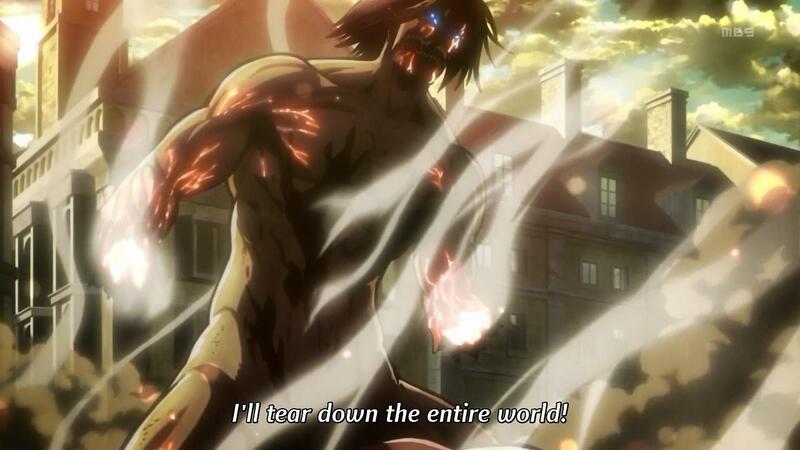 Looks like next week, they’ll face an interesting Eoten…maybe Eren will be forced to use his power again.